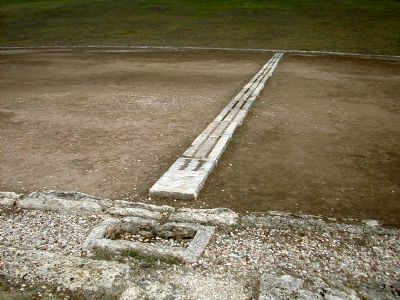 The stadium at Olympia has gone through many modifications throughout its history. The Germans excavated it in the late 1950’s and early 1960’s. They restored it to its fourth century B.C. form. The stadium could seat 40,000 persons, but never had permanent seats. To view another very well–preserved 40,000 capacity stadium—at Nemea—Click Here.